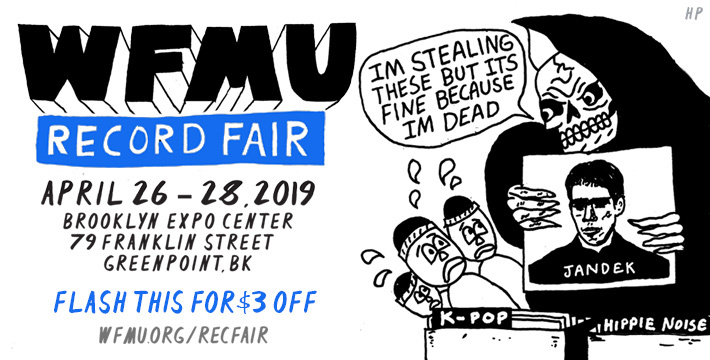 The WFMU Record Fair throws down April 26th, 27th, and 28th at the Brooklyn Expo Center in Greenpoint, Brooklyn (79 Franklin St)! Luxuriate in a gigantic, vinyl-filled room packed wall-to-wall with Rekkids, 45s, CDs, videos, books, posters, collectibles, the Homespun Merry-Go-Round, and sunlight! Live bands will be announced soon! Be sure to check out the full schedule of events, film screenings in the Movie Lounge, and RSVP to our FB events. And if you pay at the door, just flash this coupon for $3 off admission.